Dr. Lefkowitz is an Investigator of the Howard Hughes Medical Institute, Professor of Medicine, and Professor of Biochemistry and Immunology at Duke University Medical Center. Lefkowitz was an undergraduate at Columbia College and received his M.D. Degree from Columbia University College of Physicians and Surgeons. He completed his medical, research and clinical training in cardiovascular disease at the National Institutes of Health and Massachusetts General Hospital. Lefkowitz moved to Duke University in 1973 and has remained there since. His research has focused on the molecular structure and regulatory mechanisms controlling the function of the seven transmembrane family of receptors. Lefkowitz is a member of the National Academy of Sciences, the Institute of Medicine and the American Academy of Arts and Sciences. 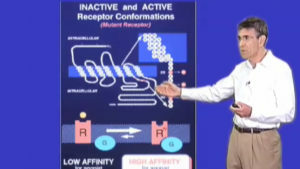 In 2012, Lefkowitz was awarded the Nobel Prize in Chemistry in recognition of his seminal contributions to understanding G protein coupled receptors.